I spent the past few days in (somewhat) sunny Florida for the 6th annual runDisney Princess Half Marathon weekend. I have about a million stories to share, but I wanted to give a small recap of the amazing time I had! Aside from a 2 mile fun run during last year’s Disney Social Media Mom’s Conference, this was my first official runDisney event. And they did not disappoint! One of the best parts about runDisney is the obvious tie-in to one of my favorite destinations in the world! When at Disney Parks, you aren’t just running during a race weekend. If you’re like me, you will find a way to squeeze every last bit of magic out of your time in either Florida or California. For a look back on my magical weekend, check out my video recap! From the massive Expo full of information and goodies to the expertly run races, I was completely thrilled with my first runDisney race experience. The atmosphere was fun, encouraging and welcoming to runners of all skill levels. The folks at runDisney estimated that 40% of Princess Half runners were competing in their very first half-marathon this weekend. With an estimated 24,000 runners I’d say that is pretty amazing! Disney races are awesome for new runners because they provide so much fun and entertainment along the course. It’s easy to get distracted from the sometimes unpleasant side of running long distances which is definitely a plus. Couple that with the expert training tips from Jeff Galloway and you can’t lose! I use Jeff Galloway’s run/walk training plan and it has made all the difference in my ability and desire to run. When I realized it was perfectly ok to go at my own pace (even if that included some walking) I found myself wanting to run! I am not the fastest of the pack, but I finish strong and that is what matters to me. I found that most run/walkers like myself tried to follow race etiquette and stayed to the right of the course. This is very helpful not only for the straight runners, but for the other run/walkers who may be running when you want to walk. I also found both the Enchanted 10K and the Princess Half Marathon to be exceedingly well-stocked with water stops and plenty of bathrooms along the course. I tried to drink something at every opportunity and I think it made all the difference in my energy levels. The last thing I wanted to do was get dehydrated. Not only was I pleased with my personal performance, I had a great time on the course! During the half, I knew there would be many opportunities to stop for photo ops or just to take it all in. I wanted to take advantage of this without killing my time so I had a little strategy. I found that by waiting until we entered the Magic Kingdom to stop for character photos, I was able to find quite a few with very short lines allowing me to get in and out quickly. Running through the Magic Kingdom was exhilarating and I knew it would be quick. It was a great time to stop for photos so I could be in the park a little longer. Of course I can’t forget the bling! 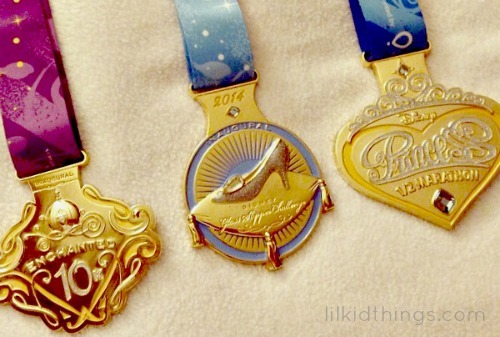 Because I participated in the Inaugural Glass Slipper Challenge, I earned 3 medals! I ran in the Enchanted 10k on Saturday and the Princess Half Marathon on Sunday (with about 6,000 of my closest friends) for a total of 19.3 miles! I was so nervous about getting it done but I felt amazing after both races. I think this must be that runner’s high I keep hearing about and I likes it! Do you have questions about runDisney or racing in general? Feel free to ask in the comments and I will do my best to answer you. I am already planning my next race and I hope I will be “running” Disney again real soon! Disclosure: I paid for my race registrations and my trip to Florida. 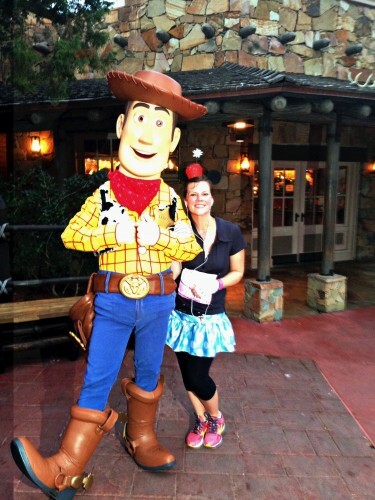 runDisney provided me with accomodations and other fun surprises over the course of our weekend. I was not asked to write anything about my experience and all opinions are my own. Thanks for reading! Now you need to sign up for the Walt Disney World Marathon so you can ride Expedition Everest for the very first time DURING a runDisney race! One of my favorite new people I met this weekend…hope to see you real soon! Yes to Everest, side eye to Marathon. I won’t say NEVER….but…yikes. So glad I met you this weekend. Total bonus! That looks like SO much fun. And the medals are gorgeous. 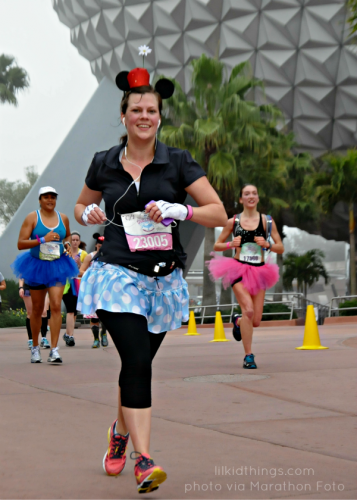 While I’m an avid exerciser, I’ve only done one race so I’d love to do a Disney race! Something to add to my bucket list. Melissa, you would LOVE it! I really want to try the kids races with the boys. That is next on my list!